Kenya is amongst the 10 most dangerous countries for pregnant women. Between 6000 and 8000 women die every year during childbirth; the current maternal mortality rate is 488 deaths per 100,000 live births. Kenya has made little progress in reducing this to achieve the commitment set in the Millennium Development Goals of 147 deaths per 100,000. However, thanks to the introduction of free maternity services for women by the Government of Kenya in 2013, Kenya's dire maternal death rate may finally begin to fall. The First Lady of Kenya, Margaret Kenyatta, has emerged as a true champion in this cause. Her drive and resolve has put the spotlight on Kenya's efforts to reverse this tragic trend. In January 2014 she spearheaded the Beyond Zero Campaign to raise awareness about the link between good health and a strong nation, specifically demonstrating the importance of maternal, newborn and children's health. As part of the campaign, she ran both a half and full marathon to galvanize support and mobilize resources. And her clarion call, "no woman should die giving life" has resonated across the country and globally, now even transformed by a Kenyan band into a theme song, titled, It Has to be Now. For this innovative work, Mrs. Kenyatta was voted by the United Nations (UN) in Kenya as the UN person of the year in 2014, a well-deserved recognition for which I congratulate her. It is remarkable that she has used her position as the First Lady of Kenya to tackle a critical human development issue and has demonstrated extraordinary initiative, integrity and courage to save the lives of women and children. I had the honor of meeting with the First Lady of Kenya in September to discuss a University of California, San Francisco initiative to address pre-term births. I was struck by her knowledge about the current situation and determination to improve maternal, newborn and child health in Kenya. The momentum created by the First Lady's Beyond Zero Campaign is driving several other important initiatives and changes to policy from a variety of stakeholders to improve Kenya's MDG 5 report card. At the 2014 UN General Assembly in September, the Government of Kenya announced that it will increase its health budget from 5 percent to 15 percent of its national budget. And, in August, the United Nations Population Fund (UNFPA), led by its Representative to Kenya Siddharth Chatterjee, spearheaded a very important initiative to convene 15 of Kenya's 47 County Governors, which represent nearly 98% of the country's maternal deaths. The meeting saw a range of partners from the Government, the private sector, the UN community, national and international NGOs, donor countries and the media converge, all important stake holders in advancing maternal health in Kenya. The County Governors signed a communiqué to end maternal deaths and improve the well-being, protection and health of adolescent girls. This pragmatic strategy will help to tackle the wide inequity and inequality gap and contribute to reversing maternal deaths. Innovation, investment, commitment, partnerships and leadership at all levels must form the cornerstone for advancing and accelerating progress to meet the targets of MDG 5. I urge the County Governors of the 15 Counties -- Garissa, Homa Bay, Isiolo, Kakamega, Kisumu, Lamu, Mandera, Marsabit, Migori, Nairobi, Nakuru, Siaya, Taita-Tavet, Turkana and Wajir -- to lead the fight to end maternal deaths in their respective counties and faithfully comply to the commitments made in the communiqué. 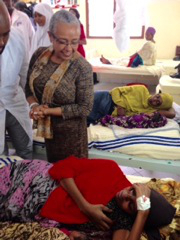 There is great momentum in Kenya to end the terrible tragedy of women, infants and children dying needlessly. The First Lady of Kenya has kicked the ball towards ending maternal deaths and now the Governors must ensure that it is pushed through the goal posts. This is not about partisan politics and nor is this about political grandstanding. This is a fundamental human development issue and it is about principles over politics. As a nation-state Kenya owes it to its women and children. Ambassador Eric Goosby is a Professor of Medicine and the Director of the Institute of Global Health Delivery and Diplomacy at the University of California in San Francisco. He was formally the Global AIDS Ambassador of the United States of America overseeing the PEPFAR programs.